An LMS (Learning Management System) is an online platform that allows creating, managing, tracking, delivering and reporting educational courses. It removes physical barriers and helps reach people who otherwise would not have been able to attend learning courses. Creating online courses used to be quite a daunting task and required a high level of expertise and IT resources. But things have changed with the advancement in technology and now even beginners can create their own online course delivery system. LMSs cover all aspects of online learning, including planning and delivering courses and managing attendance, applicants and other administrative matters. The original concept dates back to early 1900s when audio-video started to emerge as a medium of delivering lectures. Universities were the first to adopt the new medium and started telecasting classes before the concept finally went mainstream. Thanks to the advancement in technology and widespread availability of the internet, we now live in the information age where information is easily accessible to everyone. LMSs take benefit of these advancements to the fullest and allow delivering quality courses at a fraction of the cost associated with delivering education in a traditional way. 2 Why Learning Management Systems? 3 Why WordPress as LMS? Almost anyone or any organization can take advantage of Learning Management Systems to deliver specialized courses. The platform is not just limited to educational institutes as government institutes, private companies, as well as not-for-profit organizations, have also been using it to deliver, manage and evaluate courses. The following points help determine if you or your organization really need an LMS and if the answer to some of these is yes, you probably need to have an LMS in place. The reasons are quite obvious. It removes physical barriers and is a very convenient and cost effective way of delivering educational content. An LMS makes it easier to automate processes and manage, track and evaluate eLearning activities. It saves instructors from manually maintaining the educational content and automatically keeps track of registrations and attendance. The platform helps individuals, companies, government institutes and other organizations create a centralized learning system with integrated tracking, reporting and evaluation capabilities. Future upgrades are also easier as everything can be updated in real-time from a single location, while there is also no shortage of LMS platforms, which range from beginner-friendly to enterprise-grade options. The power and flexibility of WordPress allows site owners to accomplish a variety of goals ranging from maintaining blogs to running e-commerce and Learning Management Systems (LMS). The platform not only makes it easier to start implementing different platforms, but also offers powerful tools to manage them more efficiently. Self-hosted WordPress is available for free, is reliable with the right pick of hosting provider and offers great flexibility through plugins. It helps save a lot of money, time and other resources required in manually building a Learning Management System. There is also no shortage of LMS plugins, which means you can pick the one that perfectly fits your budget and requirements. Maintaining courses after creation is another area where WordPress LMS plugins come handy. They require less time in maintaining eLearning resources compared to doing it manually. Most plugins do most of the maintenance part automatically, reducing overall cost and effort. The choice and freedom WordPress offers is unmatched and that’s why around a quarter of all websites are powered by the open-source, freely available WordPress. Picking the right plugin is important as your whole business will be built around it, to make the selection process easier, we have handpicked some of the most popular and multi-purpose Learning Management Systems that can adapt according to individual requirements. If you need a theme for your website, check out our guide we put together of the Best LMS WordPress Themes. 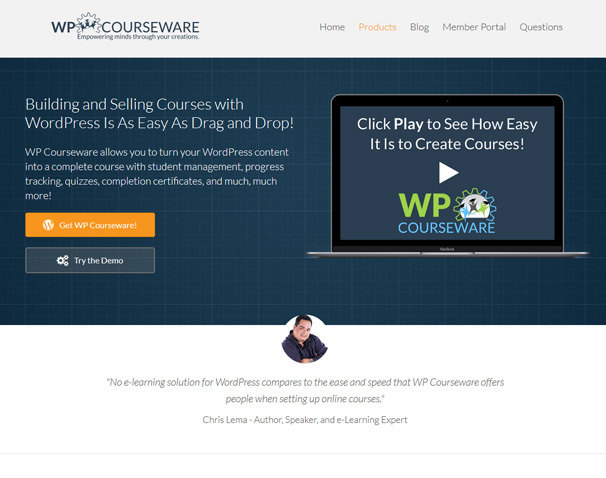 WP Courseware by Flyplugins offers a drag-and-drop interface that makes is easier to build and sell courses online. The plugin includes a student, attendance and progress management system and comes with almost everything needed to turn WordPress into a full-fledged LMS. The plugin is trusted by some big names and is being used by some of the industry giants, including CNN and Verizon Wireless. Not only the plugin offers powerful features and tools, it’s also easy to use than most other LMS plugins. The drag-and-drop interface makes creating courses a breeze, while the protection features allow restricting course content. Content can also be dripped and site owners can schedule it to be delivered at specific intervals or time. A 2-site license targeted at teachers is priced at $99, while Professor (10 sites) and Guru (25 sites) licenses cost $125 and $175 respectively. Licenses have to be renewed each year, but users can keep using the plugin even without renewing. However, they won’t be able to receive bug fixes, future updates and compatibility support. 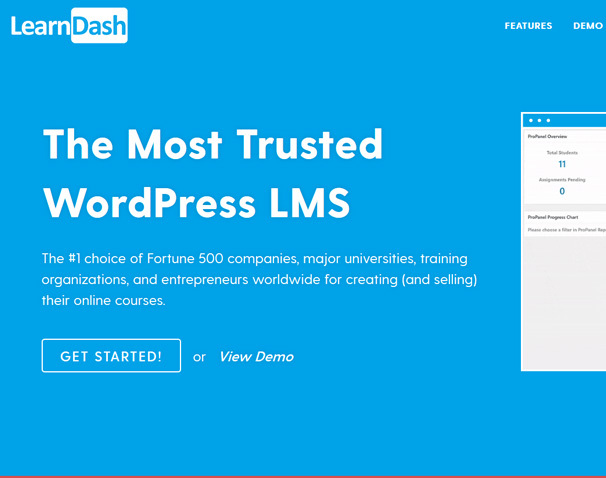 If you are looking for a feature-packed WordPress LMS plugin that’s also easy to use, LearnDash is easy to recommend. It supports multi-tier courses with topics, lessons, categories, quizzes and more. The plugin works well with a variety of payment gateways, including PayPal, 2Checkout and Stripe, while seamless integration with WordPress eCommerce and membership plugins makes the plugin one of the most flexible out there. Many well-reputed universities, fortune 500 companies and entrepreneurs rely on LearnDash to create and deliver lessons online. The all-in-one online learning management solution offers a whole bunch of features, including drip-feeding, engagement triggers, automatic reminders and much more. Multi-tier courses allow users to break down courses into different layers and lessons, quizzes, topics and categories. Implementing a shopping cart is also easy for selling more courses and works with WooCommerce, Easy Digital Downloads and iThemes Exchange. Traditional membership plugins such as premium MemberPress and PaidMembershipsPro are also supported, which means students who purchase a membership can also enroll in online courses. ProPanel enhances the plugin administration experience and consolidates assignment management and reporting. It shows course activity in real-time and allows easily downloading quiz results and progress. The overview data provides all the important information at one place such as the total number of students, courses, pending assignments and essays. Pricing starts from $159 for 1-site license with unlimited courses and users, while Plus package costs $189 and supports up to 10 site licenses. The Pro package is priced at $329, offers unlimited site licenses and works well for users who are full time into delivering online courses. ProPanel is only offered with the Plus and Pro packages, which makes the Plus package a better choice for most users. 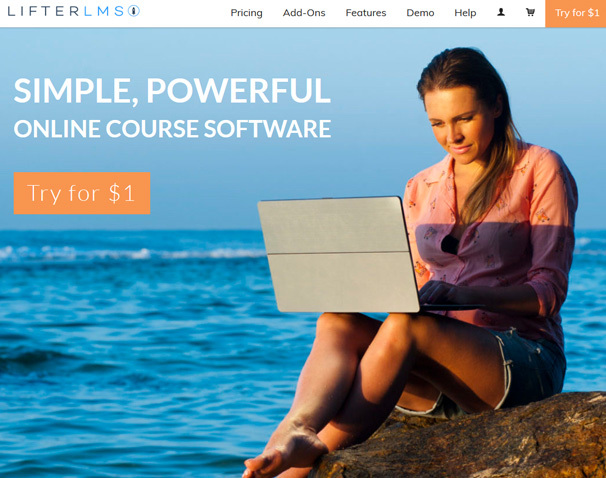 LifterLMS is a simple, yet powerful WP LMS plugin that provides users with complete control over revenues without complicating things for starters. The platform makes it easier for different industries including health and fitness, business and marketing, programmers and technologists, musicians and artists and education entrepreneurs to deliver engaging courses that the students would want to finish. The plugin can be set up on existing WP sites fairly easily and offers almost every feature one would expect in a complete LMS solution, including support for different payment gateways like PayPal and Stripe. Multi-tier courses are part of the deal and offer flexibility to create courses in layers. Its powerful engagement tools help boost student engagement and include gamification with badges, automated emails, rewards and certificates. In addition to the built-in features, the plugin also supports a variety of add-ons and integrations with eCommerce plugins. The Universe Bundle is priced at $299, while the Infinify bundle costs $699 and includes all the add-ons the Universe bundle offers plus Live Office Hours and LifterLMS Advanced Add-ons. Individual add-ons such as eCommerce, marketing, app integration, LaunchPad theme, Support and Graphics pack cost $99 each. This makes LifterLMS a relatively expensive solution as users have to buy add-ons separately if they don’t buy the Universe or Infinity bundle. Created by the team behind WooCommerce, Sensei follows the same best practices as WP and WooCommerce and offers a lot of flexibility and functionality. It a good option for users who are not looking for all the advanced options other more expensive solutions offer and want a straight-forward solution that works great with WooCommerce. Creating courses, quizzes and lessons is fairly simple using the plugin, but integrating it with WooCommerce can prove to be hard for beginners. Users can also extend the functionality of the plugin through the collection of extensions that allow tailoring the LMS according to individual requirements. Although the plugin misses many advanced features other top-rated plugins offer, it can be used in conjunction with membership and eCommerce plugins to sell more courses. Lack 0f third-party integrations can be an issue for advanced users, which makes Sensei more suitable for users who are fully into WooCommerce and want hassle-free integration with it. Pricing for single-site license costs $129, while 5-site and 25-site licenses cost $179 and $279 respectively. LearnPress LMS plugin is a perfect solution if you do not want to pay hundreds of dollars for premium plugins. It’s free and offers most of the features and tools other plugins offer, including easily creating courses and selling them online. It’s lightweight, fairly easy to use and comes with a variety of add-ons that extend functionality and provides users with more control over their online courses. However, not all the add-ons are available for free and you have to pay for some of them. The Education WP Theme is also available for $69 and includes the full theme. 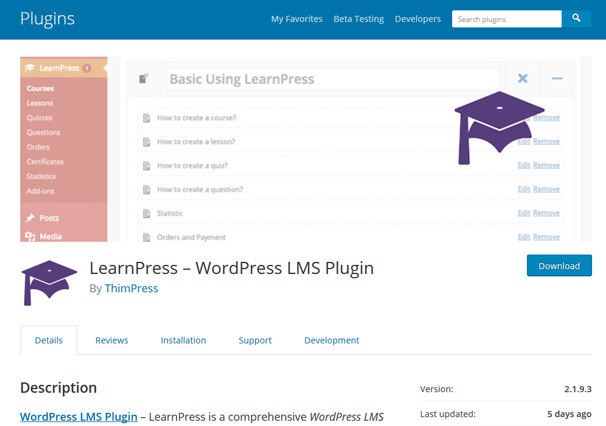 As one would expect from a quality plugin, LearnPress can be integrated with WooCommerce, bbPress and WordPress membership plugins. Content dripping, scheduled delivery of content, assignments and quizzes, scoring and more are part of the package. Initial installation may prove to be a little hard for starters, but once you are done with that, the plugin is fairly easy to use and allows easily creating lessons, quizzes, questions etc. The default payment gateway is PayPal, but you can use other systems by paying for add-ons. You cannot really expect round the clock live support from a free plugin so free users get limited support. Paid users, on the other hand, get support from official forums, which get the job done in most cases. If you are not looking for all the advanced features and want a hassle-free freemium plugin, LearnPress comes highly recommended. The plugin even comes with its own analytics tools, supports multiple courses, paid lessons, student enrollment and more and can be integrated with BuddyPress for better student engagement.